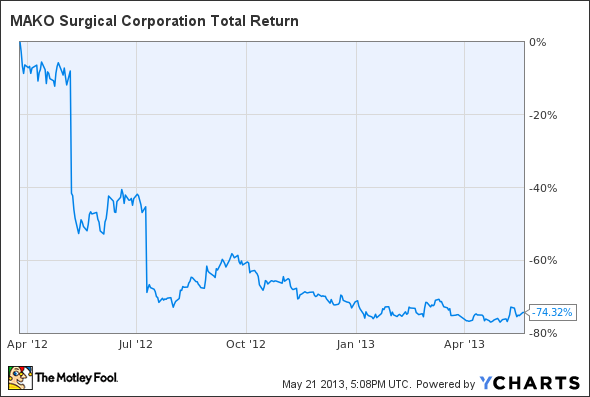 MAKO Surgical stock has fallen 75% from its 2012 high of nearly $44 per share. Here's one way MAKO could climb back to those levels. So what would it take for MAKO to regain its former glory? Well, for one, remember much of that meteoric rise was the direct result of over-enthusiastic RIO system sales projections, and we all remember what happened when the company failed to live up to those expectations. In fact, some shareholders were so furious about the ensuing drop that they filed a class action lawsuit, in which they alleged they were misled by management. Of course, I just noted yesterday one such case was dismissed thanks to MAKO's "forward-looking statements" clauses, but the damage to management's rapport with investors remains evident even after the company posted two consecutive decent quarters. Then again, the reason investors were so excited about higher system sales in the first place wasn't the significant upfront revenue benefit, but rather the resulting long-term increase in the number of procedures. You see, each time a surgery is performed using MAKO's RIO platform, the company benefits to the tune of roughly $5,000 in recurring revenue from the sale of instruments and implants. However, surgeons can currently only perform two different types of procedures using MAKO's system -- partial knee replacements and total hip arthroplasty. Even then, considering that MAKO only just introduced the hip solution in September 2011, only 65% of the 156 systems currently in place are equipped to enable THA. As a result, only 467 of the 2,988 procedures performed last quarter were hip replacements. On a positive note, that did represent an 18.2% sequential increase over the previous quarter, which shows that hospitals are finally beginning to utilize MAKO's hip replacement tech on a greater sale. Still, customers who owned MAKO's RIO robots in 2012 only performed an average of just 6.7 monthly procedures per system last year, and monthly utilization per site fell to 6.6 procedures last quarter. By contrast, consider MAKO's soft-tissue counterpart in Intuitive Surgical (NASDAQ:ISRG), whose customers performed around 13 procedures per month last year with each of Intuitive's da Vinci robots. Of course, while the folks at MAKO can obviously increase the number of total procedures performed by selling new systems, that's easier said than done given the RIO's seven-figure price point. Until that growth avenue picks up more steam, then, you can bet MAKO will focus on increasing utilization. 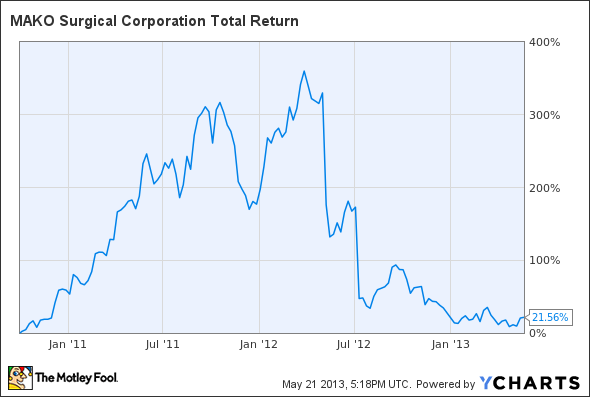 How, then, does Intuitive Surgical manage to maintain such high monthly utilization numbers? Thanks in part to the complementary instrumental requirements of many soft-tissue surgeries, surgeons are able to perform literally dozens of different procedures using Intuitive's da Vinci platform. That's exactly why one of the four big questions I posed going into MAKO's fourth-quarter report earlier this year revolved around whether the company had news on the development of new surgery types for the RIO. As I noted at the time, CEO Maurice Ferre did tell investors last November the company was working on a total knee replacement solution, but he also warned at the same time we shouldn't expect to see it in the near future. Then again, when the company (mostly) answered my questions in February, management elaborated one of their "key operative priorities in 2013" was to continue collecting and analyzing user feedback and use it to "further enhance [their] product offering." In fact, one of the yet-to-be-officially mentioned technologies that I'm waiting to hear about from MAKO is a shoulder replacement procedure. As I first noted last October, San Francisco Surgery Center Administrator Jeff Wong even stated the following in a Q&A session last August: "While we have focused exclusively on partial knee replacements up till now, we anticipate leveraging the robot for hip replacements and possibly shoulder repairs in the near future." Call me crazy, but that doesn't seem like something one would say without at least having a conversation about it first with the minds at MAKO Surgical. In the end, when MAKO eventually announces one or more new procedure types while continuing to increase the number of hip procedures performed, I see no reason why the resulting enthusiasm couldn't push the stock back near all-time highs. However, remember that this a long-term speculative bet that won't happen overnight, so, as always, patience is key to realizing big profits with this young stock.